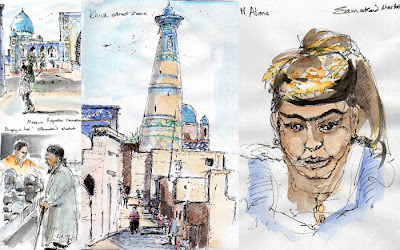 Talented Sydney artist Christine Shoji travelled with me to Uzbekistan in April 2011. She's a fast and fabulous drawer: curious crowds would gather as she sketched in markets and monuments. They were transfixed. Christine produced a beautiful, visual journal of the trip. If you'd like to know more about her work, send her a message via the contact form.